With the Lima Group meeting in Ottawa, on February 4 the news of the crisis in Venezuela has hit Canadian headlines. 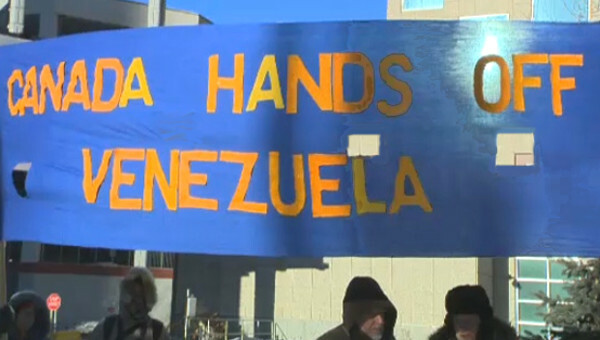 This short guide intends to provide some key talking points for progressives who might not be ready to comment on what is happening in Venezuela, but are critical of the interventionist stance of the Canadian government. 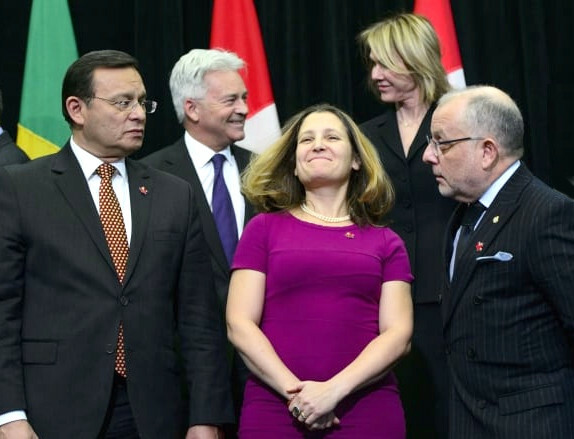 Canadian Foreign Affairs Minister Chrystia Freeland meeting the Lima Group in Ottawa. 1) Canada should not follow the USA’s foreign policy position on Venezuela, particularly given its history of self-interested interference in the region. Trump has appointed controversial U.S. diplomat Elliott Abrams as special envoy for Venezuela. Abrams was convicted for misleading Congress in Iran-Contra affair, and was linked to the failed coup against Chávez in 2002. He is also implicated in the whitewashing of the massacre of a thousand men, women and children by U.S.-funded death squads in El Salvador, when he was Assistant Secretary of State for Human Rights in 1981. U.S.-led interventions do not bring peace and justice, or promote human rights: quite the opposite is true. To name but a few recent examples: the U.S.-led invasions in Iraq, Afghanistan, Syria, and Libya led to regime-change, but also intensified humanitarian crises and led to long, drawn-out civil wars. For more information, see the recent blog by Gus Van Harten and article in Truth Dig . There are is no guarantee that a U.S.-backed intervention (e.g. 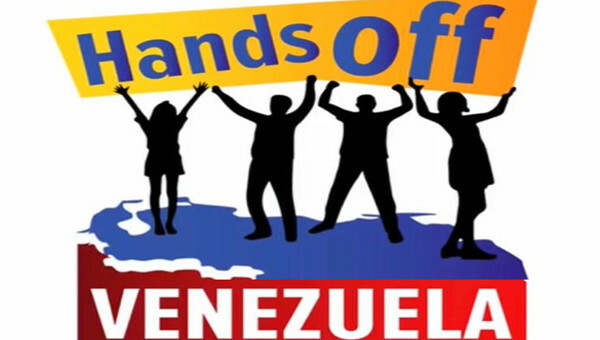 oil sanctions and military invasion) will bring peace and ‘restore democracy’ in Venezuela. 2) Canada’s position undermines due process and democracy in the region. Like the U.S., Canada does not have right to do whatever it feels like in other countries; Venezuelan polls show strong majority of Venezuelans aren’t happy with Maduro and would like to see him removed via a negotiated solution but not via foreign intervention. The history of North American imperialism means that any new government in Venezuela that came to power through this process would be seen as tainted. Canada’s public statements recognizing Juan Guaidó, President of the National Assembly, as the interim President of Venezuela undermine the legitimacy of due process in Venezuela. 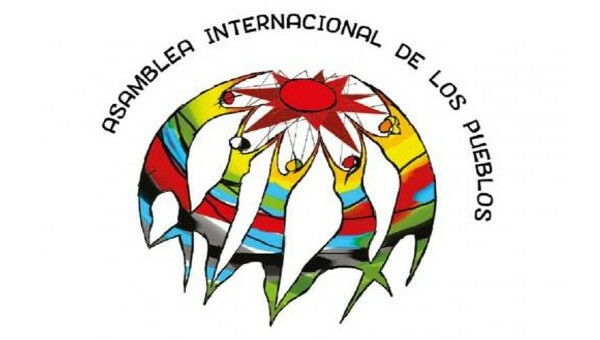 The International Electoral Accompaniment Mission of the Council of Electoral Experts of Latin America (CEELA) issued a report on the May 2018 Venezuelan presidential election and states that the electoral process for the Presidential and State Legislative Council Elections 2018 complied with all international standards and national legislation, particularly in the fields of audit and electoral administration. 3) Canada’s reputation (deserved or not) as a champion for democracy and human rights is once again being put into question. In many other cases, a country’s failure to follow democratic norms has not bothered the Canadian government: China, United Arab Emirates, Egypt (2016), Honduras (2009 and 2017), Brazil (2018), so why is Canada jumping on board with the Lima Group, which was only established because previous efforts by right-leaning governments failed to win majority votes at the Organization of American States (OAS)? It is deeply disappointing to see Canada taking a one-sided approach. In supporting the opposition in Venezuela, which is quickly moving even further to the right, Canada is contributing to the exacerbation of the conflict which may possibly lead to an escalation of violence and civil war. 4) There is an alternative to military intervention. 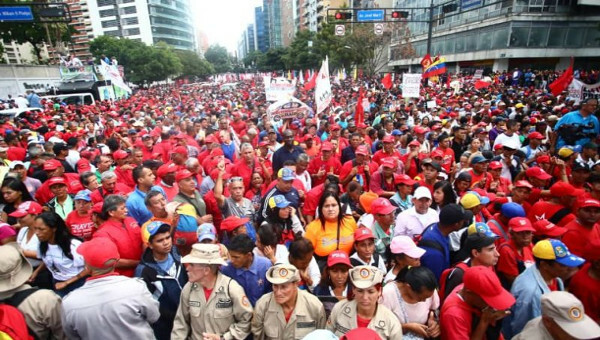 Canada should support a negotiated, peaceful solution to the crisis in Venezuela and foster dialogue between the elected government and the opposition, under the auspices of states from the region (and not Canada and the USA). Canada should support calls made by the governments of México and Uruguay, and the Caribbean Community (CARICOM) to offer their offices to mediate a dialogue. The United Nations Secretary General António Guterres and Independent UN rights expert calls for compassion, not sanctions on Venezuela. Renowned linguist Noam Chomsky, filmmaker Boots Riley, and over 70 other academics and experts on Latin America condemn the U.S.-backed parliamentary coup and call for a renewal of the dialogue process that took place between the Venezuelan government and opposition groups in 2016-17. Canada has played a leadership role in the past in favour of peace, democracy and human rights, such as playing a positive role in the 1980s in El Salvador peace negotiations. Canada’s role was crucial in helping broker the El Salvador 1992 Peace Accord through the United Nations. We could be playing a similar role in Venezuela by partnering with the Uruguayan and Mexican governments rather than the American government under Trump. * This disclaimer informs readers that the views, thoughts, and opinions expressed in the text belong solely to the authors, and not necessarily to the authors’ employer, organization, committee or other group or individual. Laura Avalos is Regional Working Groups Program Assistant at the Canadian Council for International Cooperation.